Would you like to start living the RVing lifestyle but aren’t ready to buy a recreational vehicle of your own yet? Then, be sure to try the RV Rentals in Philadelphia available here at Fretz RV! We offer only the top brand and highest quality RVs on the market, and with both motorhomes and travel trailers available, you are certain to find exactly what you want. Let’s take a look at the reasons why renting an RV for your next vacation will make it the best trip yet! Travel with ease with our RV Rentals! Traveling should be a time of rest and relaxation, and with a recreational vehicle, this is exactly what you will get because everything about an RV is meant for luxury and convenience. For example, one of the main things you can enjoy about traveling in an RV is the freedom to travel where and when you want. By bringing along your lodging as well as your mode of transportation, there will be no long security lines or waiting for your luggage to arrive or get lost. Everything including food and beverages will right at your fingertips. Traveling in an RV will also allow you to enjoy the journey as well as the destination. See the gorgeous countryside as you drive down the road, and if you see a local restaurant you want to try or a sign for a neat place to visit, you can just pull over and enjoy! Get the perfect home-away-from-home with our motorhome and travel trailer rentals! Renting an RV comes with its fair share of benefits, but so does renting from us here at Fretz RV. For instance, with our complete safety and maintenance inspections, we ensure that all of our rental models are in the best shape to take you where you want to go. We also offer a complete fleet of non-smoking RVs, so each floorplan will be nice and clean to provide a comfortable place to call home. Plus, with items such as an air conditioner and microwave in each unit, you will have all of comforts of a home on the road. 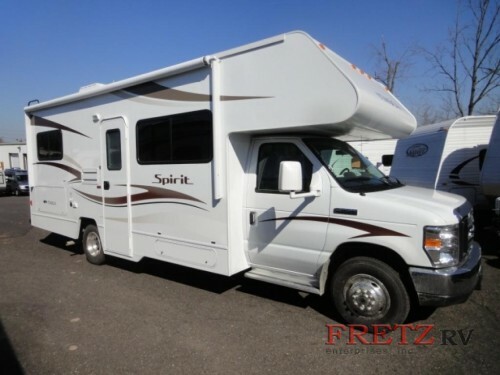 If you are ready to hit the road in style and comfort, take a look at our beautiful RV Rentals in Philadelphia! You can also contact us or stop by our location to learn more about why you should rent an RV for your next trip.